Formed in 1992, Trollhättan, Sweden’s Lord Belial is a Swedish death metal band with a reputation for xenophobia. The band’s The Art Of Dying demo tape kicked things off in 1993 and was followed by Into The Frozen Shadows which featured a flute. The three Backelins and Niclas Andersson signed with Stockholm’s No Fashion Records and issued the mildly zoophiliac Kiss The Goat in 1995. The album’s release was delayed due to the band’s dissatisfaction with the cover print. Enter The Moonlight Gate was recorded at Studio Fredman in Gothenburg. The album featured female vocals courtesy of Dark’s female consort. Headline shows and tours with Dismember and Disfear followed. The group also found time to appear on Iron Maiden and Bathory cover albums. The Unholy Crusade was recorded with Andy LaRocque at Los Angered studio. Vassago would depart in late 2000 citing personal differences with the Backelins. He would return in 2001 for two years before departing again. The guitarist would reappear in 2006. Angelgrinder was supported through a tour with Corporation 187. Fredrik Wester departed reporting a lack of time. Micke would also temporarily leave. His replacement was Daniel Moilanen who himself would quit during the next album’s recordings precipitating Micke’s return in late 2003. The Seal Of Belial would be the band’s first for Regain Records and would be released with a one-year delay. 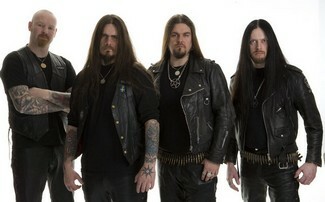 The band had reportedly left No Fashion Records after the label refused to issue the song Purify Sweden. Metal Fortress Entertainment issued the Scythe Of Death EP in 2003. It featured the Purify Sweden track. Hjalmar Nielsen would join on guitar. He would depart after the completion of the recording for Revelation. His replacement would be the perennial favourite, Andersson. The group was booked to play at the Wacken festival for 2008. Regain Records would re-release several demos of the band on CD. The release was called Ancient Demons. Regain Records released its new album, The Black Curse, in September through Regain Records. Seventeen years on Sweden’s Lord Belial called it a day in February of 2009 effective immediately. Drummer Micke Backelin had tinnitus and needed a medical break. The band returned only in the summer of 2010 and was writing new material. Lord Belial signed a deal with Dozer Records and would begin recording a new album. This is the fourth album of the Swedish black/death quintet which is now back up to full strength with three guitars with the recent return of Niclas Pepa Andersson into the fold. Recorded at Los Angered Studio by Andy LaRocque, the album presents a gruesome image befitting its title. Flesh and blood is strewn and hacked everywhere. It's pretty gory all around. You have to love the album title too. One can imagine a big apparatus set up somewhere. You shove the angels into one end and obtain 'Turkey Bologna' at the other end. Musically, a song like Burn The Kingdom Of Christ shows the band's influences. Representing the original Swedish death sound, Lord Belial comes across as incorporating elements akin to Vomitory and Necrophobic. They do incorporate melody and slower breaks amidst the mayhem. Sadly one hears keyboard and flute interludes here and there as well. A re-recorded and older song, Satan Divine, shows the band's lyrical progression more than anything with its simpler and shorter lyrics. The track packs a lovely solo though. Sadly whatever the merits of the album, and there are several as you have read, these are negated by the drum machine which covers most of Angelgrinder. The monotonous and lifeless drone of the offending computer plasters the album with a sound so generic and dreary that one frankly wonders why bands insist on using these. Will it really kill you to have your drummer play on the album? It could have saved your album you know.